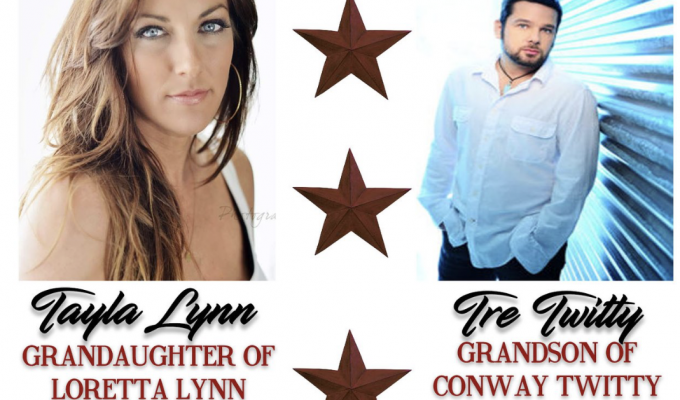 Performed by Tre Twitty and Tayla Lynn – Grandson and Granddaughter of the Legendary duo. Tre Twitty brings a performance that is country at its heart! 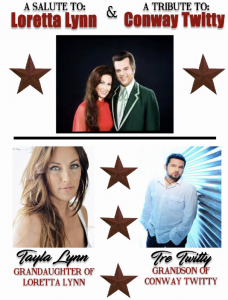 One thing in this big wide world is for sure, musical talent runs deep in the Twitty family’s blood. Conway Twitty was one of the most legendary country musicians of all time, creating numerous hit albums and singles that are still enjoyed today. Tayla Lynn’s life could be a country song, which is no surprise considering she was born into the country music dynasty created by her grandmother, Loretta Lynn. She’s experienced success as a songwriter and artist. She write the life she lives on a farm #fingerfarm with her husband, Jon Cody and 2 little boys Tru-5 and Scout-2. The farm is adjacent to her grandmothers “Loretta Lynn Ranch” in Hurricane Mills, TN. Sign-up to receive the Arlington Music Hall newsletter and stay up to date on all of our upcoming events!